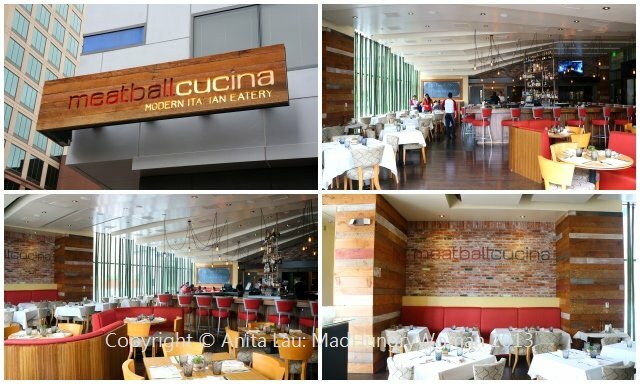 On a visit to San Diego recently, my friend Vivienne and I visited Meatball Cucina, a relatively new restaurant located within an office building in the downtown area. The decor and the feel of the interior was chic and modern, but I was intrigued by the menu and its name because it reminded me of The Meatball Shop in NYC. The menu isn’t quite The Meatball Shop, but instead, a variety of meatballs are featured along with a bunch of other dishes. The owners are from Italy and I was excited to possibly eat some very authentic Italian fare. Even before you order, a basket of bread arrives. 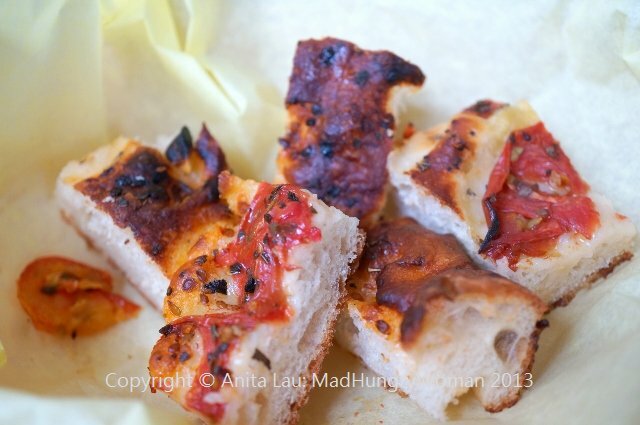 Foccacia topped with tomato sauce and some herbs for you to munch on while you peruse the menu. 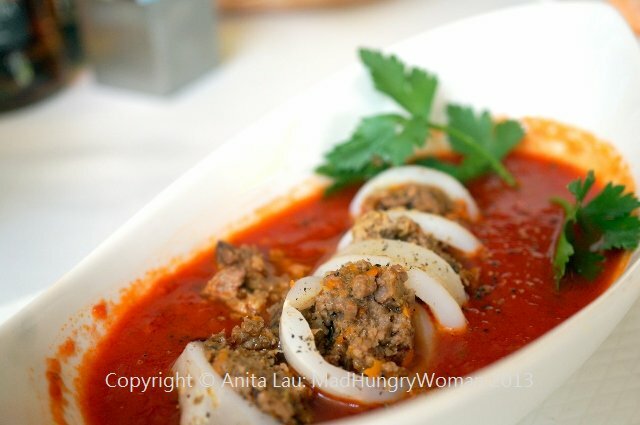 We started with Stuffed Calamari ($8.95), whole squid stuffed with seasoned ground meat to form meatballs. I liked the light spicy tomato sauce which is reminiscent of food in Italy, but not necessarily, the American style Italian cuisine we find here. 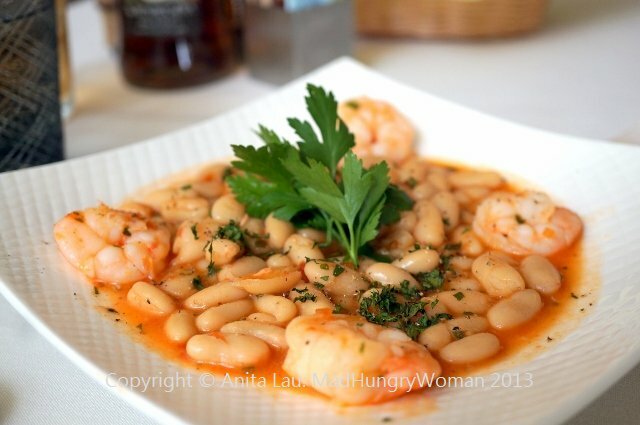 I’m a big fan of cannellini beans so when I saw Shrimp, Cannellini Beans and Pancetta ($8.95), I knew I wanted to try it. Again, the dish is light, the shrimps very fresh prepared with shallots in olive oil. The only thing was, I didn’t detect any pancetta in the dish. Vivienne and I were excited to try the meatballs, so we decided on the Meatball Sampler ($14.95) to fully partake on a variety without filling up too quickly. 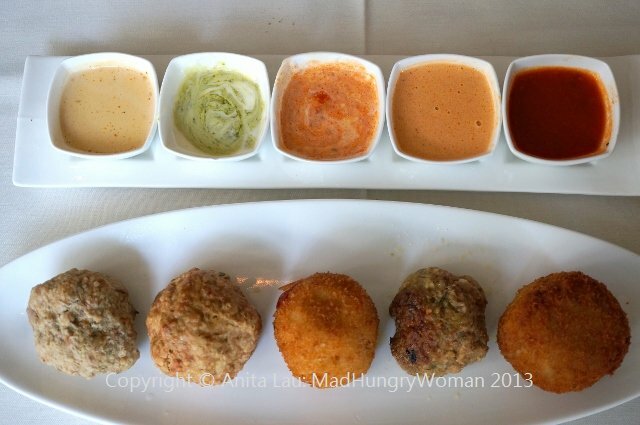 We chose five meatballs with five different sauces to accompany. Veal, turkey, fish, vegan and classic. The veal was on the bland side, but I was really surprised by how flavorful the turkey was. Our server was the one who recommended this and I was glad he did. 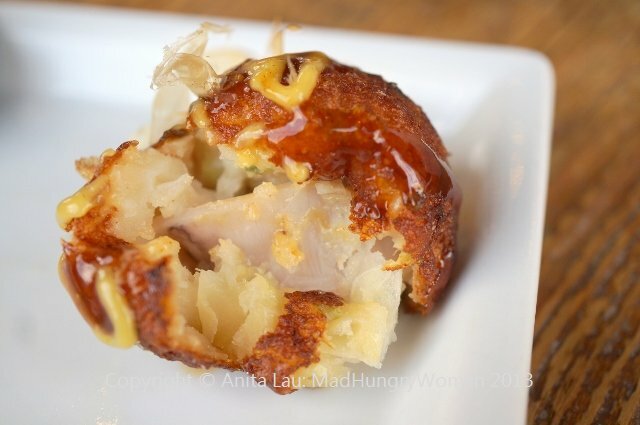 The other favorite was the vegan, a combination of cauliflower and other vegetables coated with breadcrumbs and fried. It definitely was one of the best offerings on the plate. The sauces of classic tomato, pink tomato, basil pesto cream, roban and buffalo & gorgonzola were again on the lighter side. We expected the cream and cheese sauces to be thicker but they weren’t. I preferred a lighter sauce, however, it didn’t allow for a good coating around the meatballs. My favorites were the classic tomato and roban. We decided on a pasta dish as well but requested an appetizer portion and they complied. 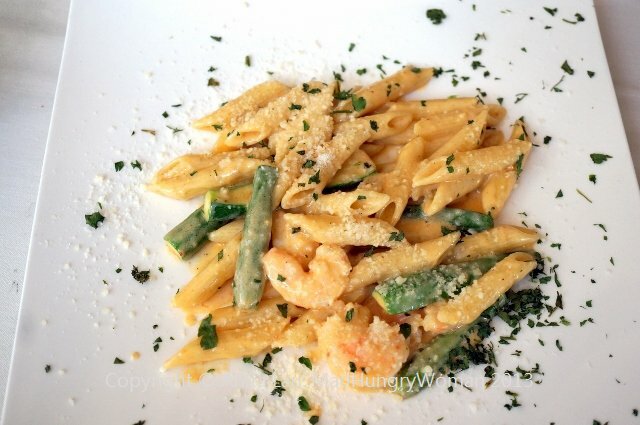 Penne Portofino ($14.95) with shrimp zucchini tossed in a roban cream sauce was perfectly al dente. Shrimp had a great snap and seasonal zucchini made for a great accompaniment in both color and taste. 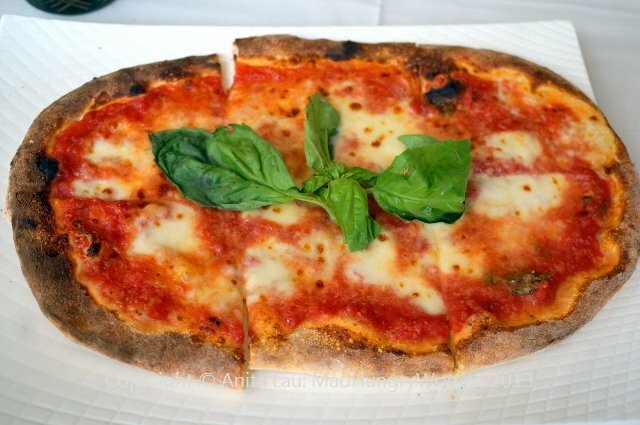 We couldn’t leave without trying a pizza and for under $10, the Margherita Pizza is a good portion for lighter appetites as a meal, or for two to share. We finished with Deconstructed Cannoli ($6.95), already cracked so you won’t crack your teeth biting into it. 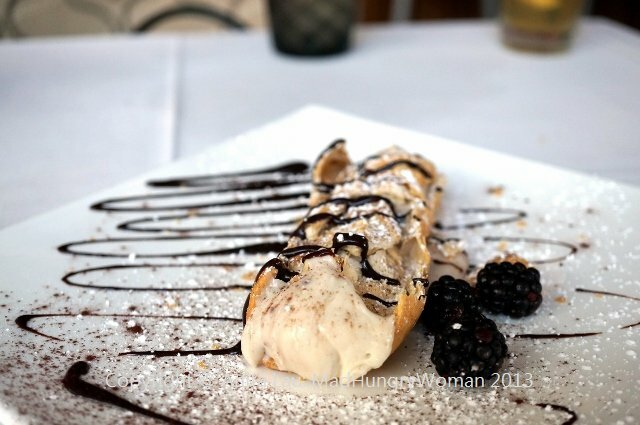 The cannoli shell is imported from Italy and the ‘filling’ is light with only a hint of sweetness. Very enjoyable. The restaurant is still new but there is huge potential for major growth. The only thing which might hinder lunch time customers not within walking distance is the parking situation. Although there is a parking structure in the building, it cost me $25 for the duration of my lunch. The restaurant validates in the evenings, but that doesn’t solve the issue of lunch time visitors. I was scrolling through Twitter one day and saw an entry about a ramen place serving tsukemen, but it was in San Diego. 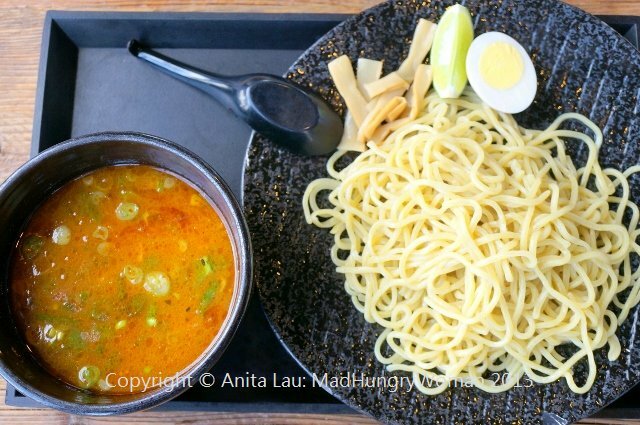 I love tsukemen, a ramen style noodle dish served with a dipping broth on the side. Very few places in OC serve this and I’m always looking for better ones to try. After a few tweets here and there, I decided to bookmark it for a future visit when I was down in San Diego. I finally made it there after months of anticipation and was really surprised at this gem immersed in the chaotic mess that is Convoy Street. The wood exterior stood out and the interior was a well thought out space of minimalistic eco-friendly chic. 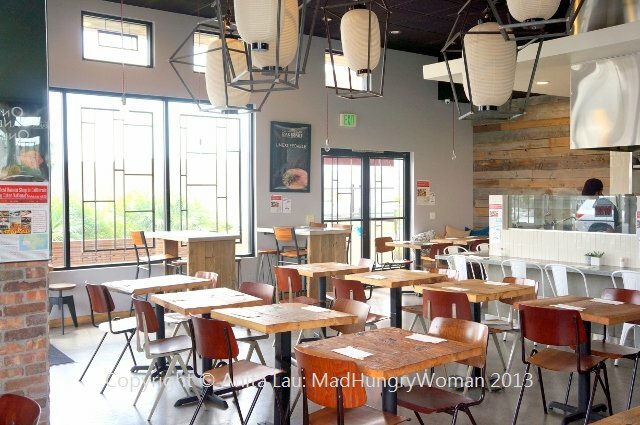 The menu is extensive with ramen offerings as well as sushi, and rice bowls. Also on the menu are various tidbits generally eaten as snacks. I saw several Japanese favorites and wanted everything — too bad I only have one belly! We are served alkaline water — complimentary — and I love the taste of this. I buy alkaline water from the grocery store so I know the health benefits. 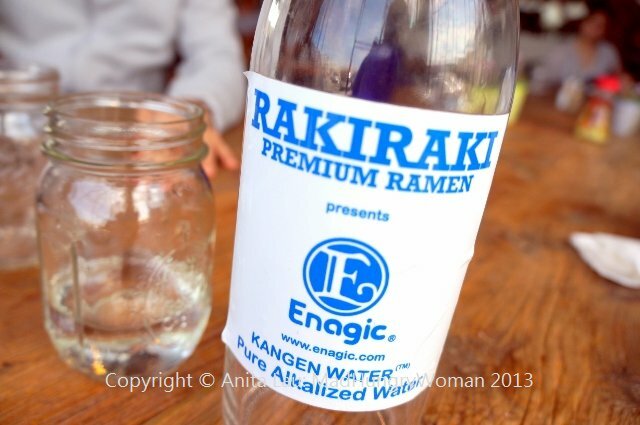 Believe it or not, the broth for all the ramen is made with this alkaline water. I was excited to taste it! 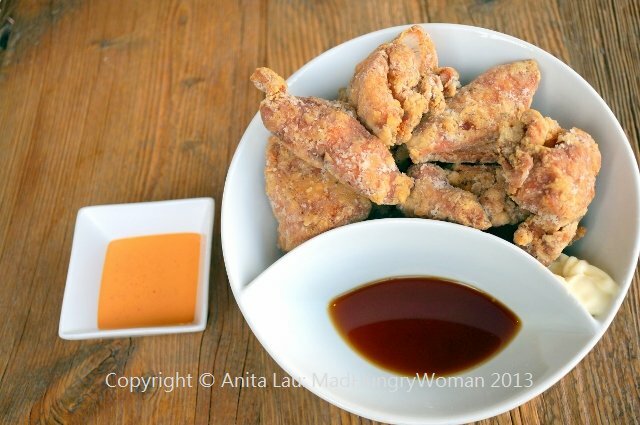 But before getting to the ramen, we started with Chicken Karaage ($5.75). I’d like to say I’m something of a karaage expert simply because I always order it wherever I go. I was happy to see a really generous portion for under $6. The exterior was nice and crispy while the interior was moist and juicy. They use organic chicken here and I can definitely taste the difference. It was nicely seasoned and I wanted to eat piece after piece, but had to pace myself. 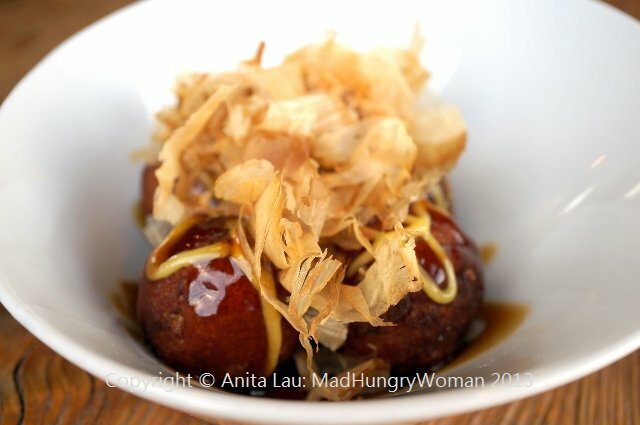 I’m usually not a huge fan of Takoyaki ($4.50) due to its texture, but found these very pleasing. They were not doughy and mushy, but had a lovely bouncy texture with a nice chunk of octopus hidden inside. The dough wasn’t toothy and really quite good. 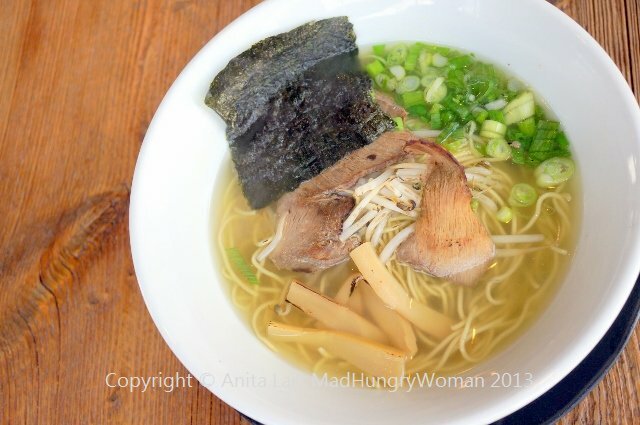 When it came to ramen, I wanted to start off with the Original ($7.25), a chicken base broth packed with flavor, but is not thick and does not have that cream-like consistency like its pork bone counterpart. Some days, I just want a clean, light bowl of noodles and this would be the perfect choice. Maybe it’s the alkaline water, but the broth has a very clean, crisp finish on the palate. But wait! Look here! Something is really different with the ramen. I notice some scorching on top. The scallions are scalded and so is the chicken. What’s going on? 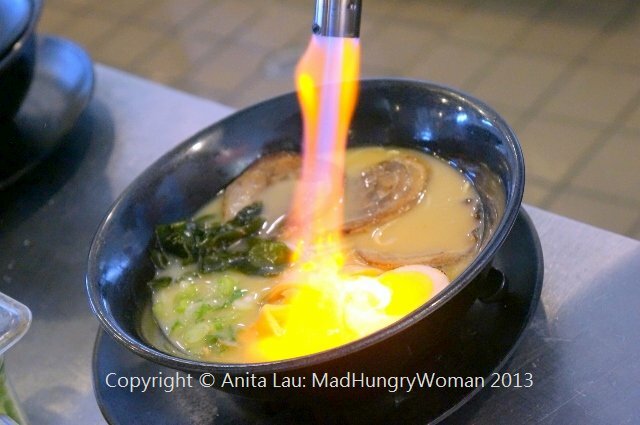 Each bowl of ramen here is scalded with a torch to give the toppings a ‘seared’ touch. It makes everything pop just a little bit more. I like it! What I came here for was the tsukemen so I was looking forward to Spicy Tsukemen ($9.25). I love tsukemen and there is only one place in Orange County I know which serves it. At Rakiraki, you can opt for cold or hot tsukemen and I didn’t like the idea of a meat broth being cold so I opted for the hot. The noodles were perfect in texture and the dipping broth was absolutely spot on. It was saltier than the regular ramen broth, but rightly so because this is only meant as a dipping sauce and not to be sipped like you would with ramen. The flavors were hearty and rich with chunks of pork swimming underneath. 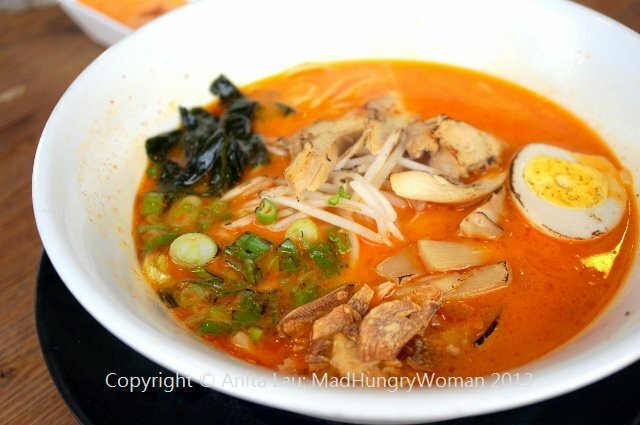 I also tried the Spicy Miso Tonkotsu ramen which was seriously good. The broth is not greasy and never leaves that gnarly film in your mouth after eating. The broth is not overly salty which happens often when I eat ramen. 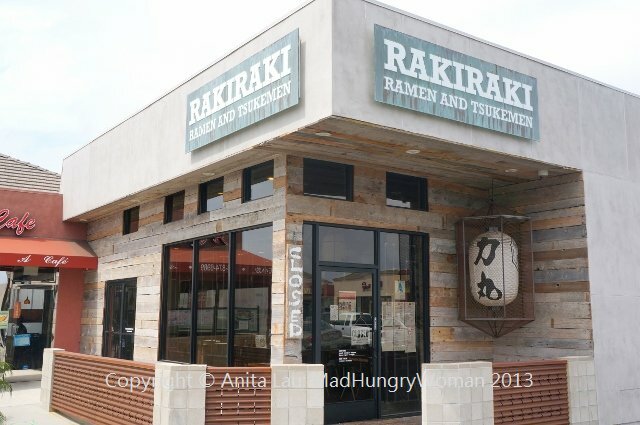 I found out that unlike other restaurants, Rakiraki simmers its broth for a certain number of hours and then they take it off the heat so it isn’t evaporating throughout the day, compromising the flavors. There are bottles of house-made infused vinegar on the table which I highly recommend you try — if you like vinegar. I love it. 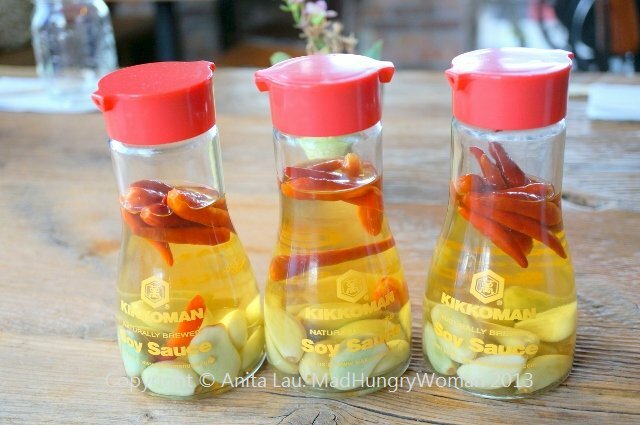 The grain vinegar is infused with imported Japanese chilis and garlic. I drizzle some onto a spoonful of noodles and I found it helps cut any of the richness you might encounter. It is so palatable I was even sipping on it. I wish they sold this! 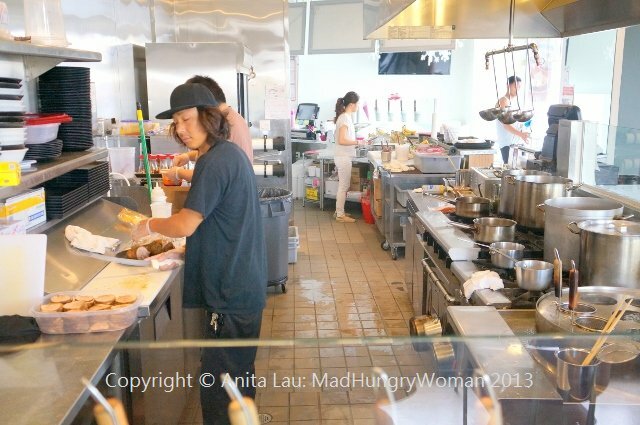 Consistency is vital to the concept of Rakiraki and it may take a few more minutes wait time than other ramen houses you’re accustomed to. The room temperature broth is brought back to boil once an order is put in so each bowl tastes the same every time you visit the restaurant. The precision taken is unrivaled. I was really impressed by my visit here. I’ll definitely be coming back again! Maybe they will consider opening one up here in Orange County!